Stocks are on fire. But are they too hot? 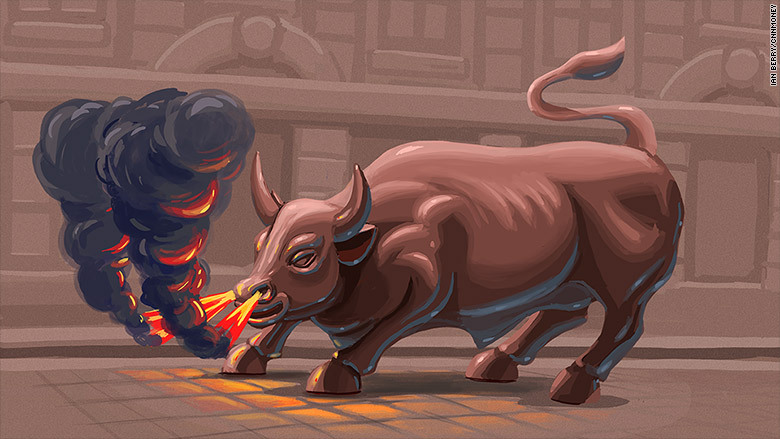 The stock market hasn't been this red hot since 2011. After tanking at the end of the summer, Wall Street has raced back with a vengeance. Fears about China's economic troubles and Federal Reserve policy have faded, sending the Dow skyrocketing about 1,500 points in October. The S&P 500 shot up 8.3% -- its best month in exactly four years. Given how much fear was in the market just a short time ago, it's incredible that the S&P 500 is just 2% away from setting new all-time highs. "October turned into a banner month for the bulls," Bespoke Investment Group declared in a recent research report. Bank of America Merrill Lynch was even more emphatic, saying the bears on Wall Street are now in "hibernation." Risk is clearly back in fashion. Even CNN's Fear and Greed index is showing that "greed" is the primary emotion driving the market now. Less than two months ago, the index was flashing "extreme fear." BofA said investors poured $15 billion into global equities in the latest period. Emerging market stocks -- a previously-hated corner of the market -- enjoyed their biggest inflows in four months. Have stocks gotten ahead of the economy? But the remarkable rally raises the risk that the stock market is on the verge of overheating -- or at least taking a much-needed breather. After all, the economy is clearly slowing down, at home and abroad. That's not going to help corporate profits, which aren't exactly glowing these days anyway. Sure, 76% of S&P 500 companies that have reported results so far this quarter have beaten targets, according to FactSet. However, profits are still on track for their first back-to-back declines since 2009. And a long list of consumer companies have alarmed investors with sluggish results. That includes CVS (CVS), Buffalo Wild Wings (BWLD), Dunkin' Brands (DNKN) and GoPro (GPRO). Wall Street will get to check the pulse on consumer spending this week when big names like Visa (V), Ralph Lauren (RL) and Whole Foods (WFM) hit the earnings stage. It could also be interesting to hear how media companies are dealing with cord-cutting consumers. Time Warner (TWX), the parent of CNNMoney, is set to report results next week along with Walt Disney (DIS)and 21st Century Fox (FOXA). The stock market is sure to be swayed by the month's most important economic metric: Friday's monthly jobs report. Economists are betting job growth bounced back in October from the previous month's weak performance. But history suggests the stock market hasn't come too far too fast. Generally, it takes 65 calendar days for the S&P 500 to recover from a correction of less than 15%, according to S&P Capital IQ. This time it's taken slightly longer. Once it does recover all the lost gains, the market tends to keep going. "Should history continue to repeat, and there's no guarantee it will, the S&P 500 may rise another 6.5% before stumbling into the next decline of 5% or more," Sam Stovall, U.S. equity strategist at S&P Capital IQ, wrote in a recent note. Recent history has also been very kind to investors during November. The Dow has averaged a very healthy gain of 2.4% over the past 20 years, posting positive returns nearly three-quarters of the time, according to Bespoke. The only month that's been better over that span has been April. What about Novembers after stellar Octobers? That looks pretty good too, with one notable omission. The S&P 500 has closed higher seven out of the last eight Novembers following October rallies of 5% or more -- like this one. The lone exception? That occurred in 2011. That's noteworthy because, as Bespoke points out, "it has been scary how closely 2015 has tracked the 2011 market pattern." But it wasn't a big drop...the S&P 500 dipped just 0.5% in November 2011. That wouldn't be such a bad thing after an incredible October.